Project type: Ground floor extension, Garden Room approx. 30 m2. 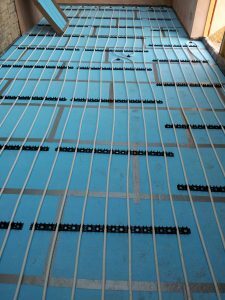 Installation method: Pipe installed using cliprail method – within a fibre sand cement floor screed. 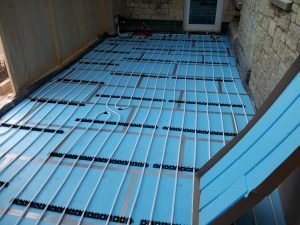 Below are pictures from one of our underfloor heating installations in Gloucestershire, in 2014. Now we use the UPM3 Auto pump while the pictured pump is the previous version called UPS2, which was also A-rated. 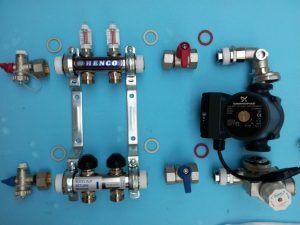 Above: Assembly of a Watts 2-circuit underfloor heating manifold with RWC mixing valve and Grundfos UPS2 pump. 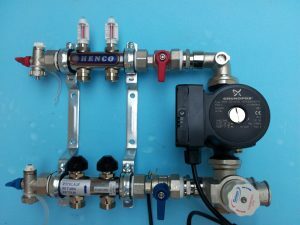 Above: Manifold is assembled and ready to fit onto the chosen position within the property. Ideally within the actual heated area itself, or at least nearby if possible. This particular installation was unusual in the fact that the customer asked us to fit our pipes on top of a thin blue foamtech board. We completed fitting our pipework with the help of clip rail, with self adhesive. Pictures below show the Garden Room extension. 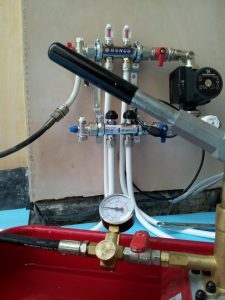 Below: We filled the system with water and did a pressure test at 6 bar, using our Rothenberger test pump. The sand cement floor screed (with fibre) was laid the following day.